As I also mentioned (Harley Heaven on Lake Winnipesaukee, June 16), we just had the nine-day Laconia Motorcycle Week, which attracts swarms of bikers to the Granite State, and racing along mountainous roads is one of their joys. Every year the event is accompanied by accidents and usually a few fatalities, but I don’t ever remember seeing one involving a bear. This one happened in the afternoon. Broad daylight on a perfect day. Unlike moose, which are slow and dumb, convinced they can continue ignoring oncoming traffic, bears can be fast-moving, when necessary, and alert. Moose-car accidents are, in fact, commonplace throughout northern New England, while bear-car encounters are also a standard news item, though less frequent. I suppose I’ve seen a few moose-motorcyclist crash stories over the years, or at least should have. This time I found myself recalling a report I’d edited and written the headline for back on my first news desk position right after college. We were Upstate New York, which has its own mountainous terrain. That time, a motorcyclist ran into a porcupine on a dark highway, and the results were fatal. As a city-boy, porcupines were still a curiosity, rather than a critter I often acknowledge in my journeys. In this morning’s dispatch, the driver was airlifted to a hospital and reported to be in critical condition. Another item making the rounds also seems to slip over from one of the routine categories — in this case, political survey results — into the I’ve-never-seen-that-before status. In the race for the White House, a Democrat, and a woman at that, is polling evenly with Donald Trump in the overwhelming Republican state of Utah. This reminds me of another reaction I often have as a novelist: “This wouldn’t work in fiction.” Accompanied by “You couldn’t invent this if you tried.” Life really does take some bizarre turns if you look. Many days in the newsroom I had the feeling of same-old, same-old. I’d seen it all before. Another election, just different names and tallies. Another car crash or house fire. A store opening or a restaurant closing. Graduations or obituaries. It’s a long list. And then something refreshing would come along, something that prompted the exclamation, “I’ve never seen that before!” Contrary to the doom-and-gloom image of the business, many of us at the newspaper loved having something uplifting to present. These days, though, it’s more likely to be along the lines of this couldn’t be happening, could it? The American presidential campaign is just the most obvious. The Woodpecker Reports appearing at the Red Barn are supposed to be a reminder of the underlying currents we thought would be shaping this election season – the history and power-brokers moving behind the scenes, especially. Things we’d seen before, round after round, including the same players or their disciples. Woodpecker can hammer away in the infected trees, as he’s been, but when the forest catches fire, he’ll take flight. I know this: things are spinning too fast to keep up. And that’s before we get to the climate instability that’s more glibly called global warming. I’m still aghast at the reports of Sen. David Perdue’s “joking” when he encouraged participants at a religious conference to pray that President Obama’s “days be few,” a reference to Psalm 109. The audience apparently picked up on the calamities to be inflicted not just on the transgressor but on his spouse and children, too – evil thoughts, without question. In the text, however, King David is pouring out his soul in response to political persecution, a situation the Georgia Republican blithely ignores. King David’s lines certainly fit as a cry for help from Obama: “Wicked and deceiving words are being said about me, false accusations are being cast in my teeth,” as verse 2 reads in the New Jerusalem translation. “In return for my friendship they denounce me. … They repay my kindness with evil, and friendship with evil” (verses 4-5) match the good intentions Obama had for reasoning with a Republican Congress. As for the evil man oppressing the king, “He had no thought of being loyal, but hounded the poor and needy and the broken hearted to their death. He had a taste for cursing; let it recoil on him!” (verses 16-17). In a broader context, we can remember that King David could be both passionate and brash, qualities that got him in deep doo-doo more than once, and thanks to Abigail, he even had to recant one of the curses he was about to impose on her husband and all the males in her extended household (I Samuel 25). While we’re at it, we can also leap ahead to Jesus commanding his followers, “Love your enemies,” and to look for the plank in their own eyes when faulting the splinter in another’s. Nowhere do I accept an argument that it can be OK to pray for evil. Only hours later came the massacre at the Pulse nightclub in Orlando, Florida, the worst mass slaying by a solitary gunman in the nation’s history. What angered me in my reaction was the notion we see all too often of blaming the victims. If their lifestyle were to blame, how then do we align that with shootings in churches, schools, even movie theaters, as we’re seeing? You’re going to blame Amish children or their parents? Come on, now! Or is something else the cause? At the moment, the United States has more guns per capita than at any previous time in its history; firearms were relatively scarce, even on the frontier, as you’ll discover reading wills from the period. The more guns, the more murders. Period. I just wish that mass shootings weren’t becoming same-old, same-old news in America, with only the numbers and frequency rising. Or that the anger weren’t fueling hatred. Maybe I need to head out to the garden to see what’s new there. Even picking weeds might be uplifting. CAN ONE CANDIDATE REALLY DICTATE THE NEWS? As we’ve noted, Donald Trump has a very thin skin. Add to that his obsession with, well, himself as he imagines himself, brooking no dissension. It’s said he dictates the position of television cameras at public events to enhance the likelihood of only flattering images. Perhaps as part of his shallow understanding of the workings of the public sphere, Trump apparently cannot separate the news gathering and reporting side of journalism from the opinions expressed in its editorial columns. Now, it seems, neither can ABC News, which puts its own credibility in question. More to the point, where does the network separate news from entertainment? Is it as soft and spineless as Trump just accused the American public of being? Where’s the truth in all of Trump’s image-building? Who’s to separate the reality before us from an increasingly weird fiction? Is it going to be left to the legions of National Football League fans he’s just insulted? Or is the court jester really in line for his own coronation? One way to take down a bully, as we recall, is for everyone to pile on together. So who will take the first move – and who will be second? After that, you can imagine what happens. Right? My, how that dates me! But let me explain. Not too long ago, writers like me were clunking away on big old manual keyboards, even in newspaper offices. The electric typewriters were more likely to be found in the jewelry store on the corner or at the bank than on the desks of people who had to type constantly as part of their employment. Well, really good secretaries also had them – with a lot of our admiration. So that’s where the photocopier comes in. The small-press editors eventually began allowing copies rather than originals, which was a big blessing for poets like me. Still, it meant finding a decent place to make copies. When I lived in the desert of Washington state, for example, a trek to Seattle four hours away included several hours making fresh copies. Once I’d moved up the management ladder a few notches, I did splurge on an electric typewriter, one I loved despite its annoying flying f that nobody could keep repaired. Half of the time it would land several spaces further down the line than where it was needed. What I really envied with the Selectric was the fact you could choose different fonts and sizes – those magical metal balls that flew around above the page you were typing. So here we are, a few decades later. 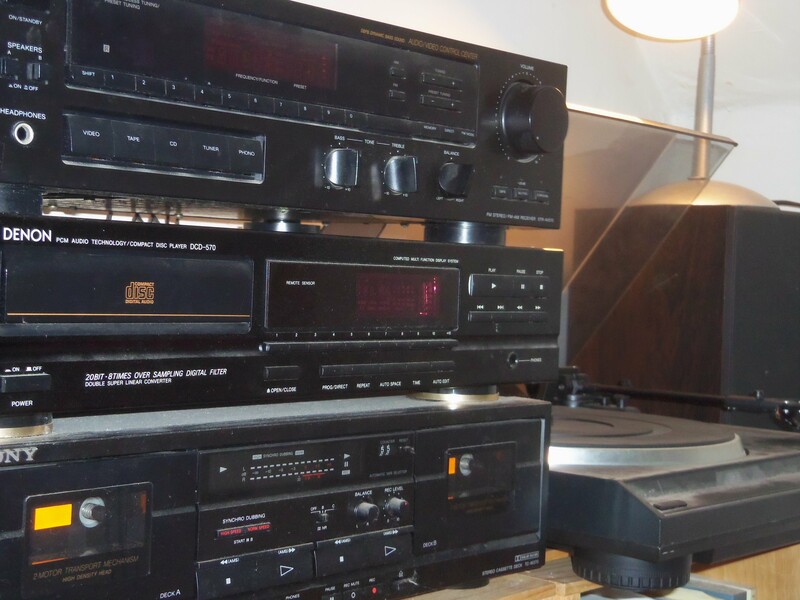 How obsolete all that has become! The computer keyboard allows instant corrections, unlike the bulky typewriter. Even the Selectric. And I have quite the array of fonts and sizes to select from, even before shopping around online for more. So much for the four or five choices in the Selectric, if that many. As for that photocopier, I can simply scan copies from the top of that computer printer for all but the most unusual projects. As for IBM and Xerox? They’re hardly the monolithic powerhouses they were then. My, how the field’s changed! Climbing around the barn the other day, I came upon a few items I now realize are ancient history. The T-square, for instance, was used for paste-ups for pages that would be photocopied for publication. But nowadays, that’s all done in the computer. The circular wheels were actually slide rules we used to calculate proportions when cropping photographs, also for publication – and once again, that’s all done in the computer these days. 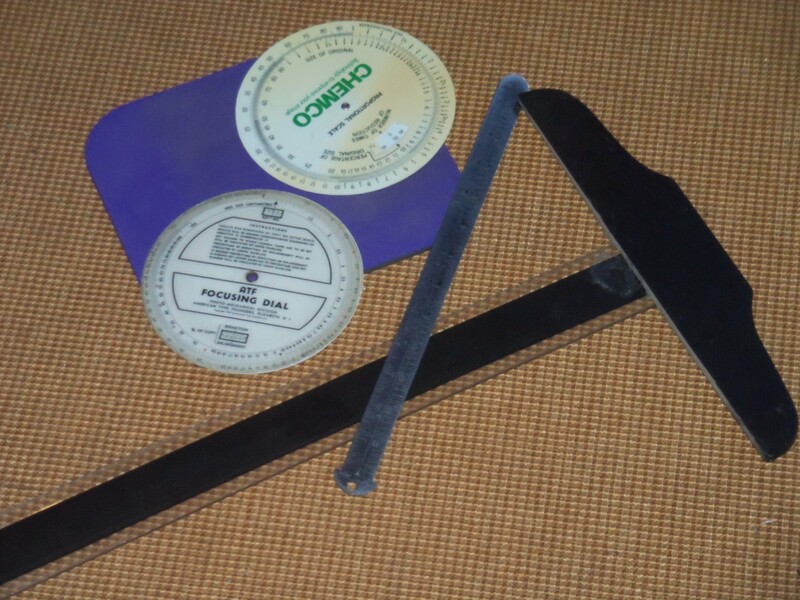 The metal ruler has special calibrations in picas and points, the measurements traditionally used by printers. You run into point measures now in the font section of your word program. And then there’s the mouse pad. You remember those, back before you switched to laptop? So I came back into the house and turned on my stereo. You may notice I still play vinyl, which probably deserves a posting of its own. When I was a teen, I dreamed of the day I’d have an entire wall of LPs and the system to play them on. Now I look at this and realize it can essentially fit into my laptop or, uh, an iPod, if I ever go there. As a writer, I love long pieces that allow a thorough investigation of a topic. Tell me the why and how of a situation, not just the final action. The longer stories, if well written and thoroughly researched, provided a sense of feasting, and I could point to research that showed some readers stayed around for those meaty offerings. I knew I had a feeling of getting my money’s worth after I’d savored one of those. Not that I felt all stories should run long – I was also a big believer in running columns of briefs, in part to make room for the longer reports. These thoughts return to me as I blog. In fact, I’m having a lot of fun “writing short” here at the Barn. You know, a couple of sentences and that’s it – especially with the photos. Without any sense of being one of them, I’ve known people who claim to see auras around individuals. They have their own vocabulary regarding what each color means. And I’ve listened without agreeing or dissenting. It’s their experience, after all. Still, I remember in the midst of one of New Hampshire’s first-in-the-nation presidential primaries when one of the hopefuls was moving through the office, along with his entourage. I couldn’t quite identify the face, but it was familiar. What struck me, intensely, though, the way he was surrounded by a black vapor. And a black aura, as they said, was satanic. Afterward, I realized it was Pat Robertson – the Reverend Pat Robertson. I still feel a chill, recalling the incident, with no way of confirming how much is true or fallacious. But others have told me the same.